Partner in Pet Food is an important player in the pet food market with a number of brands that are widely recognised by consumers. Our own product ranges to local and international market demand, and seek to exceed the expectations of ever more demanding pet parents. Today, it is a fundamental requirement – as it is in human alimentation – that pet parents want to give the best food to their beloved animals, and the food they are given is produced with care and expertise, made of quality raw materials, and allows them to have varied and healthy diets. Partner in Pet Food offers this across all segments. Get to know our product ranges, and choose your favourite! PreVital is a cat food brand, offering a wide range of excellent quality products. PreVital’s products contain optimal proportions of the vitamins and minerals required to support the development and the health of cats. They help strengthening the bones, and their vitamin E, vitamin D3, vitamin A, inulin, biotin, zinc and taurine content support the metabolism of cats to keep her in good health with a shiny coat, while also providing optimal energy day to day for our purring favourites. Our products are 100% complete food, and our range has something for everyone from the medium to the premium category. PreVital cat food come in a variety of types of packaging, in various sizes, in the form of wet and dry food, and the wide range means that all customer requirements can be met. The meat and animal derivatives content of the PreVital Naturel pouch is exceptionally high relative to average cat food, reaching as much as 82%. PreVital Naturel products contain an optimal mix of vitamins, minerals, fats and proteins, but they do not contain any colouring or artificial additives or aromas. Thanks to the practical, single-serving size, there is no need to store the pouch once it is opened. All cats will find a favourite among the many different flavours, all of which are available in jelly or in gravy. 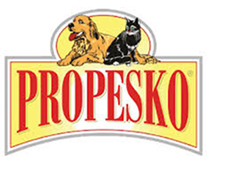 Propesko is a brand that has been long known and popular in the Czech Republic and in Slovakia, offering a wide range of dog and cat food. Our products include exceptionally high quality and varied flavours in canned meaty bites and pates, in dry food, reward treats and practically packaged single-serving foil pouch and alucups. At our two Czech plants, we use selected ingredients, the latest scientific results and the most modern technology to make our products, all of which were developed to support the health and the excellent physical and mental condition of our four-legged friends. The balanced mix of components in the complete dog food of VitalBite contribute to the day-to-day health of our four-legged friends, and hence also the happiness of their parents. Whether we talk about reward treats, or our complete dry, can or pouch, we produce all our products so as to meet all the requirements of dogs of all ages. They are easy to digest, and contain balanced levels of proteins, fats, carbohydrates, vitamins and minerals, which help protect their immune systems, strengthen their muscles, keep their coat in good condition and contribute to the ongoing health of their teeth and bones. We developed our VitalBite dog food in close cooperation with experts. Thanks to the high standard of quality and excellent ingredients, it’s use is sufficient to provide the daily energy requirement of dogs and to keep them in good condition. We believe that the relationship between dog and human is important for both parties. We take care of them, and they make our lives more complete. Therefore we aim to provide every assistance to parents with that gratifying task. Reno dog and cat food offer customers a wide range of products for the day-to-day feeding of our furry friends. Along with appropriate nutrition, the products are practical for the parents, as the Reno range includes all the popular types of packaging, from dry products through cans, alucups and pouches to salamis, making it easier to serve portions. Dog and cat food are offered in various flavours, so we are certain that the pet will also like these highly varied, tasty morsels. What’s more, our products are available on the shelves of supermarkets at a very favourable price. Nutrilove offers a wide range of premium quality complete dog and cat food. The Nutrilove range offers a number of dry and wet food with high fresh meat ingredients, all of which are characterised by excellent quality and great flavour. As the name of the brand shows, Nutrilove products offer a combination of everyday care and love offered through tasty daily meals. Nutrilove is particularly suitable for dog and cat parents who are aware of the latest trends in pet nutrition and who seek excellent quality food for their pets whose balanced mix of nutrients is a guarantee of good health and stamina. Dax brand offers a wide variety of food for adult dogs and cats. Along with dry food available in a number of package sizes, the range also includes cans, alucups, salami and pouches. The wide range only includes complete dog and cat food, with an optimal mix of the basic vitamins. What we offer: a number of flavours, varied package sizes, a range of complete food only, and all at a good price.